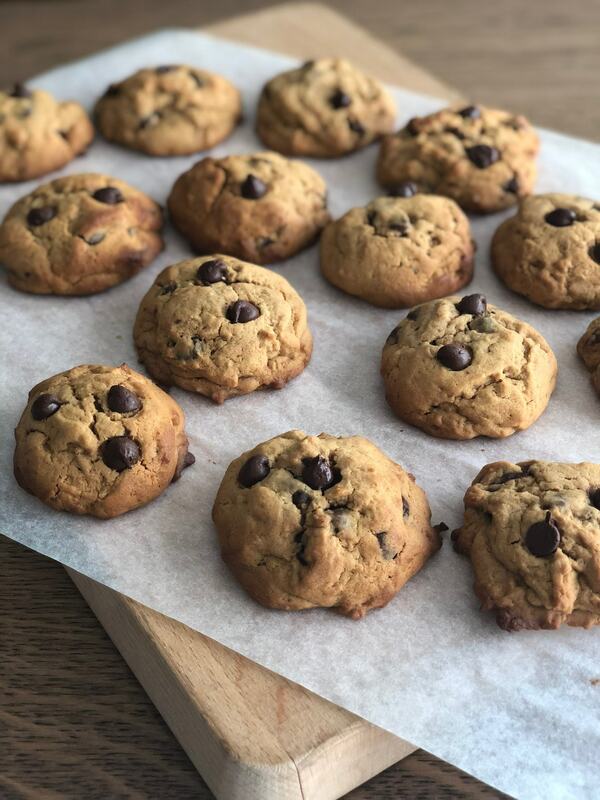 Because sometimes there is nothing better than homemade chocolate chip cookies, right? We have been pretty busy sorting things for school and getting everything ready, so those cookies were a nice treat once we were done! I found the recipe on one of my favourite Food bloggers: Klaraslife she always has amazing but simple recipes and stunning pictures! I adapted the recipe a little for us, being in Singapore means using other ingredients, that are locally or at least regionally sourced, as palm sugar. This intense dark golden sugar has a kind of mild sweetness and smoky caramel flavour, a delight! Of course, you can choose your own sugar, add nuts, white chocolate or just dried fruits instead of chocolate if you prefer. With these quantities, you will make about 18-20 cookies. 1. Warm up the butter (225g) in the microwave at low power to make it soft. 2. Whisk the soft butter with the (palm) sugar (200g) until creamy. 3. Add the egg (1), vanilla extract (1tbs) and yoghurt (1tbs) – this will make the dough incredibly soft – combine well together. 4. Now add the flour (290g), baking powder (1tsp) and salt (1/2tsp) and beat at low speed until well combined. 5. Pour in the chocolate chips (130g) – or nuts, dried fruits,… – and mix carefully as not to smash or break them. 6. Chill in the fridge for at least one hour. 7. Preheat the oven at 180 degrees. Line your baking sheet with baking paper. 8. Use one tablespoon to measure the dough: 1 tablespoon = 1 cookie. Place the dough on the baking paper leaving space between the cookies as they will flatten out a bit. 9. Bake for 11 minutes, until golden on the sides. 10. Let them cool down and enjoy with milk or cappuccino. Thanks to Kathrin of Klaraslife for your lovely Blog, yummy recipes and constant inspiration! Looking for other cookies? How about exotic and aromatic Indian cumin cookies? Warm up the butter (225g) in the microwave at low power to make it soft. Whisk the soft butter with the (palm) sugar (200g) until creamy. Add the egg (1), vanilla extract (1tbs) and yoghurt (1tbs) – this will make the dough incredibly soft – combine well together. Now add the flour (290g), baking powder (1tsp) and salt (1/2tsp) and beat at low speed until well combined. Pour in the chocolate chips (130g) – or nuts, dried fruits,… – and mix carefully as not to smash or break them. Preheat the oven at 180 degrees. Line your baking sheet with baking paper. Use one tablespoon to measure the dough: 1 tablespoon = 1 cookie. Place the dough on the baking paper leaving space between the cookies as they will flatten out a bit. Bake for 11 minutes, until golden on the sides. Let them cool down and enjoy with milk or cappuccino.